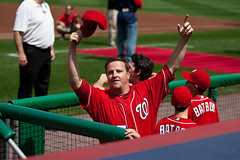 Congratulations are in order for at least one of the Caps calling DC their home at the moment — Matt Capps to be exact. Capps was named Delivery Man of the Month of April by Major League Baseball after completing 10 saves (the highest among all pitchers so far this season) and posted a 0.68 ERA with 15 strikeouts in 13.1 IP over 12 appearances. The Nationals closer also set a club single-season best and career-best record for April saves and consecutive save conversations to the start of the season. This is the first time Capps has received Delivery Man of the Month recognition. The only other National to win this distinction was Chad Cordero after he converted 15 saves in 16.1 shutout innings during 16 games in June 2005. Maybe next month Tyler Clippard will have a shot at Delivery Man of the Month? Either way, it’s nice to see the Nats pitching staff get some positive recognition.